A native of British Columbia, Diana Robertson grew up with cats and dogs at home in the Okanagon Valley. As an adult, she has lived and worked in Montana, California, Oregon and Hawaii. Robertson had her first experience in the animal-welfare field while in Hawaii for six years in the 90s. "I started volunteering at the East Maui Animal Refuge, feeding animals three days a week," she says. "It turned into a half-time job raising funds." Following her return to the mainland and to Eugene, Robertson started her own animal-welfare organization, the Shelter Animal Resource Alliance (SARA). 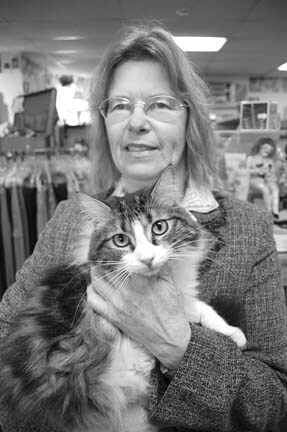 In 2001, she opened SARA's Treasures, a combination thrift store and cat adoption agency, now located at 871 River Road. In the photo, Robertson holds Bandit, a year-and-a-half-old male, one of about a dozen cats and kittens living at the store while they await adoption. "We adopt out 50 to 75 cats a year to carefully screened homes," she says. 'We're more of a thrift-shop boutique, with higher-quality merchandise. Plus you can shop with a cat on your shoulder." Learn more at sarasavesanimals.org.